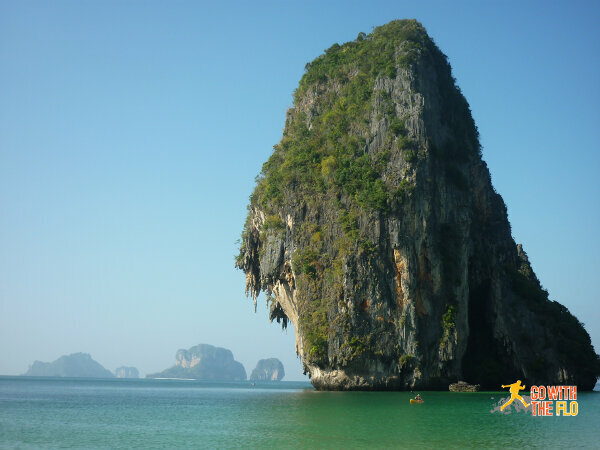 One of the most-dos when in Krabi is the boat tour to the nearby islands. There are several ways to do it, depending on what tickles your fancy. Since we only had two days in Krabi, we opted for the most comfortable and efficient way – chartering a private boat. There are dozens if not hundreds of tour agencies that will book you on big or small sized boats or arrange for a private boat. The only advantage that we saw in going to an agency, would have been the hotel transfer to the jetty. However, our hotel was within walking distance and even otherwise it is no hassle to flag down a tuk-tuk. Right by the main beach, the Ao-Nang Boat Service Co. has its office – basically your local boat-mafia. We ended up booking the “5 Isl. (Take-All)” option for THB2’200. Within minutes we set off with our boatman Ahmed. 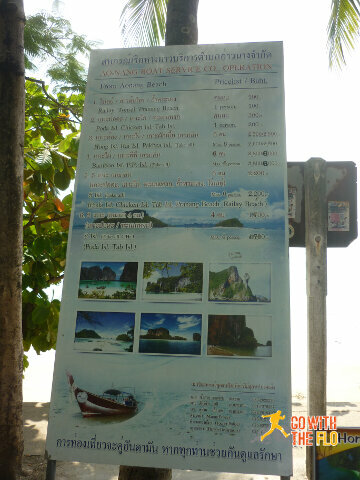 In case you want to go snorkeling (not that great), there is gear for rent (goggles and fins). The five islands that are visited are all special in their own way – Railay Beach (nice beach with a couple of hotels), Pranang Beach (again a nice beach with an impressive backdrop), Chicken Island (special for the rock that looks like a chicken’s head), Poda Island (during high tide it appears to be two separate island, while they are really connected) and Tab Island (nicest and biggest beach). If you don’t go with a travel agency, you’ll miss out on some dry sandwiches for lunch so either bring your own or buy some very basic stuff on Tab Island. Word of advice: it get’s really crowded with tourists. We left early around 8am and managed to evade the masses on the first two or three stops.